The International Olympic Committee has voted not to lift the suspension of Russia before the closing ceremony of PyeongChang Winter Olympics, prohibiting Russian athletes from appearing under their national tricolor. Full IOC membership unanimously voted in favor of the Executive Board’s recommendation to uphold the ban on Russia until after the 2018 Winter Olympics. North and South Korea have agreed to form a unified women’s hockey team for the upcoming Winter Olympics, and will march under a unified flag at the opening ceremony, according to a joint statement. Update: It’s past 10 pm in Moscow, and while many didn’t expect a response from the Russian government to the news of its Winter Olympics ban, a representative from Russian state television said it will not broadcast the Winter Olympics unless its national team is allowed to compete, according to Interfax. Meanwhile, the president of the Russian skating union says the IOC decision to ban Russia from the Olympics is offensive and insulting, and will ultimately harm the Olympic movement. In an unprecedented move, the International Olympic Committee has banned the Russian Olympic team from participating in the 2018 Winter Games in Pyeongchang, South Korea. While individual atheltes with rigorous histories of anti-doping testing will be allowed to petition to compete as neutral athletes, Russian government officials will be forbidden to attend the games, the country’s flag will not fly and its anthem will not be played, the New York Times reported. If any Russian athletes win metals as individual competitors, the Russian anthem won’t be played during the medals ceremony – instead, the Olympic anthem will sound. The record books from the games will officially record that Russia won zero metals at the 2018 games. A second batch of secret data from the World Anti-Doping Agency’s database of athletes who took part in the 2016 Rio Olympics was released by the hacking group Fancy Bears; the list includes 10 ‘doping addicts’ from the US and five more from Britain. The hacktivist group Fancy Bears published a second batch of the World Anti-Doping Agency (WADA)’s medical data on athletes who took part in the 2016 Rio Olympic Games. The publication came just a few days after Fancy Bears leaked alleged WADA documents showing that the agency had allowed US tennis players Serena and Venus Williams, as well as Olympic gold-winning gymnast Simone Biles and basketball star Elena Delle Donne to take banned substances for ‘therapeutic’ purposes. It appears Brazilian officials are not simply going to let this one go. With Ryan Lochte reportedly back in the US (and teammate James Feigen unaccounted for) following the Brazilain judge’s search-and-seizure warrant, CNN reports that two fellow swimmers involved in the alleged robbery – Jack Conger and Gunnar Bentz – were removed by Brazilian authorities on Wednesday night from their flight before it departed Rio de Janeiro to the United States, according to US Olympic Committee spokesman Patrick Sandusky. As a reminder, Lochte, a gold-medal winner, said his wallet was stolen as he and three of his American teammates — Bentz, Conger and James Feigen — were returning to Rio’s Olympic Village in a taxi. They said they were robbed by men posing as police officers, adding that the group initially didn’t contact the U.S. Olympic Committee because they were “afraid (they’d) get in trouble.” The story made quick waves Sunday, especially after Lochte, 32, detailed the alleged encounter on the “Today” show. Lochte’s account has come under increased scrutiny since then. Embarrassed Rio police said they have found little evidence to support the accounts, and a police source said they are unable to find the taxi driver or witnesses. Multiple sources told NBC Sports that Conger and Bentz cleared security and were in their seats on the plane when authorities came on to the aircraft shortly before takeoff and removed the swimmers. They are being held at the airport but are being treated well and cordially, the sources said. 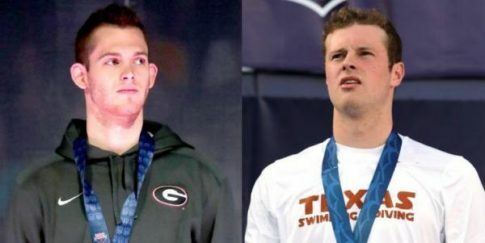 Authorities have indicated they don’t want to hold the swimmers long, but do want to know what happened during the early morning robbery, the sources said. Lochte’s lawyer Ostrow said Lochte gave police a statement as representatives from the U.S. State Department, United States Olympic Committee and the FBI observed. Lochte signed the statement to attest to its truthfulness, Ostrow said. Police have not asked Lochte for more information, and they did not ask him to remain in Brazil, Ostrow said.